We have acquired a gorgeous 1951 KGVI postal stationery item. It was printed to private order and impressed with KG6 ½d orange and 1½d green stationery heads making the 2d rate. 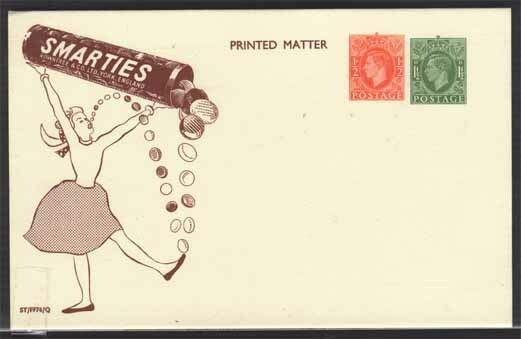 This lovely pristine item is an advertising card for ‘Smarties’ the sugar coated chocolate buttons made by Rowntree’s of York. We offered this in our March 2001 mail bid sale at an estimate of £30. We had 8 bids on it. Sold at £55. Top bid £65.